Room 19 has been searching and learning about the New Zealand Forces with knowledge. Our class task was to write a piece of writing about it and we were all interested in it. The bodies of three soldiers killed in Afghanistan have begun their journey to return back home in New Zealand. Afghanistan would've been Luke Tamatea's (Corporal) final tour of duty. His family and friends did not have a chance to welcome him home. He was only 31 years old alongside medic Lance Corporal Jacinda Baker, 26, of Christchurch, and Private Richard Harris, 21, On the 4th of August, Lance Corporals Rory Malone and Pralli Durrer were killed during an ambush in the area of Bamyan. 10 soldiers have been killed this year and I bet you that the families eyes are filled with tears. 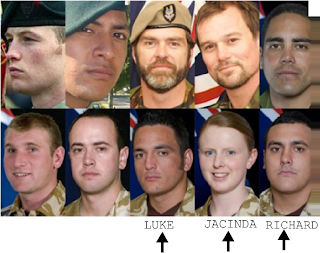 You may be thinking/wondering, ‘How were they killed?’ Well, the soldiers that passed away most recently were killed on the road-side with an I.E.D bomb which stands for, “Improvised Explosive Device.” Our New Zealand Soldiers have been in Afghanistan since 2003!! They will be staying there until 2013. So that means they have been there for about 9 years. I feel very sorry for their families. From above, there is a picture of some soldiers that has passed away. The New Zealand soldiers has worked really hard. Especially without their family for,9 YEARS!!!! Wow! I'll just CRY!!! FOR MY FAMILY!!!! !